Beautiful country house in secluded gardens, surrounded by secular pines and cypresses. Excellent public transport from outside the garden gate. Car is not necessary. Just 10 kilometres or 30 Min. by bus/ metro, 20 minutes by car, from historic center of Rome. We offer added car minibus service at reasonable rates. WI-FI. Swimming pool (summer months). barbecue area. The property is divided in four self-catering residences: West wing and Ezedra Wing of main villa, Farina Cottage, Mezzaluna Cottage. All are independent with independent entrances. The park is large and offers plenty of privacy to all. The houses are comfortably and elegantly furnished with some antiques and paintings by past masters and modern artists working with us in our ground breaking Storygardenz project. All the units are self-catering but delicious meals and half board are provided to order under the main veranda. We have some great wines from our local wine selector’s club. This estate and Lemniscati garden belong to old aristocratic families (Italian and English), and has witnessed some world shaping historic events (beginning and end of the Roman Empire, beginning of Christianity, guardianship of the Treasure of Jerusalem to name but a few). It has been a meeting place for artists, thinkers and innovators since 1950, as narrated in Anson's book "The Garden of Lemniscati" and is central to a EU project Stories in Place. Also a fairy tale garden for children. In short, a significant part of your entertainment and education in coming to Rome is right here, outside the doors and windows of the houses of this (story) garden. Bernard Anson Silj, (a.k.a. DADO), born in Rome (Italy) 1948, of British father and Italian mother, educated at Harrow and Trinity. His formative years between Britain and Italy and subsequent time as a young man, in India and Tibet, fuelled his lifelong fascination in reality, imagination and Zen and the workings of the mind. Between 1980-1990 successfully runs and manages his own multi-national aircraft interior design company (Nortech Ltd. London, Rome, Oslo, Seattle). In 1989, founds Laboratorio dell’Umanesimo in Rome, running residential workshops on humanistic, scientific and transpersonal subjects, with eminent thinkers. 1998 founds Belvedere Italia internet based cultural tourism in Italy. 2007 founds the European Storygardenz project, promoted by the Italian Ministry of Culture. 2012 initiates European Community storytelling project 'Seeing Stories', funded by the EU, with Scottish Storytelling Center and 4 European countries. From the beginning RVS property in Rome is developed as pilot storygardenz. In 2012 is cultural director and content curator/creator for multinational company marketing Italian luxury in the world. Here, begins to realize importance of storytelling for marketing. In the same year begins experimenting with map making and application to Google Maps (Mapzofimagination). Storyteller, lecturer and speaker in Europe and USA, author of several works including “Pedagogia e Carisma nella globalizzazione” for Sapienza University and “Carmen Via, A journey in the songlines of Italy” (Semar Press, the Hague). His latest work “The Garden of Crossed Destinies” written specifically for RVS is about to be published. In 2011 participates, as artist, in exhibition at MLAC museum Sapienza University. In 2010 interprets himself in US film directed by David Rich “Going DADO”. Is presently active in researching and writing many geo-located tales for the expanding Storygardenz project in Italy and in Europe. This property was part of a huge estate - 14,000 hectares purchased by Bernard's grandfather in 1885. including some extraordinary archaeologiical remains: the villa of Augustus Caesar, the triumphal arch of Emperor Constantine. The estate is smaller now and many of these features are now concentrated here at Villa Silj, which in the early 20th century became a meeting place for eminent artists. The present owner, Bernard, as a storyteller and artist has continued the tradition, with contemporary artists. This property, offers the combination of the city and country living: a fairy tale garden suited for reunions, retreats, meetings, weddings and family groups. A project in search of lost time (quality time) to encourage conversation, listening and “doing nothing” profitably: an innovative mix of stories, art, combined playfully as a riddle and quest as evinced in the book written for this garden "The Garden of Lemniscati" a book cultivated like a garden, a garden written like a book" (stoires illustrated in the garden include Fall of the House of Hypnos (prehistory and myth), Etruscan Song of Circular Time (legend and history), the Egg of Imperial Succession, the burial of Tacitus (history), The Donation of Constantine (history), Roland, Charlemagne, 1001 Nights, the Great Lost Treasure of Jerusalem and Treasure Island, Three Languages Grimm (fairy tale), DA DA-NEO-DA-DA (contemporary art). This is a story garden and fairy tale garden as seen in the book "Lemniscati" and also in the art installations and archeological remains. A book accompanies the garden and property with some wonderful history and tales. We had a wonderful stay. The property is vast with friendly horses next door for the kids to feed. It’s so close to Rome’s tourist sites (30 euro taxi) yet far enough outside the city for peace and quiet. The owners were great help when we needed. It’s a quaint property. We had an incredible team weekend at Villa Silj. Bernard and his wife were the best hosts I’ve had yet with Vrbo. They were accommodating, resourceful and made us a once in a lifetime dinner that was paired with tasty organic Italian wine from the region. Highly recommend for large groups, weddings, events or just a weekend with family. Graceful, Welcoming, The Real Thing! We thoroughly enjoyed our stay at Villa Silj - and we plan to return, hopefully soon, with our children. Villa Silj rests atop an extensive relaxing garden with centennial mediterranean pine trees - a privileged setting that we found beautiful and soothing. The garden surrounds the main house and is peppered with distinct places, outdoor rooms, sculptures and sensations in a very open, welcoming way. It is well kept, green, open, tall and spacious, and unlike many important gardens, nothing in it evokes the petty will to command, to order or show off- and this we found sincerely welcoming and -truly- elegant. Like the garden, the apartments and our hosts, Dado and Eleonora. Our apartment was a free standing two-story small building, with a porch, a dining room-kitchen, a living-room and study, a bathroom and a bedroom with one great, warm (november ) double bed with linen sheets. Upstairs-which we didn't need nor use on this occasion - there were more rooms for a further 4 adults and more children. The apartment had everything one needs to live autonomously, in good quality and good style - without pretense - and provides a spatiousness, quietness, independence, economy and ease of living which would be impossible at a hotel or anywhere in the center of Rome. Dado and Eleonora welcomed us like friends and made us feel immediately and fully at home. They have made Villa Silj their home over the last 25 years or so and are the living representation in the depth and breadth of all the nice qualities they have put into the apartments and the garden. 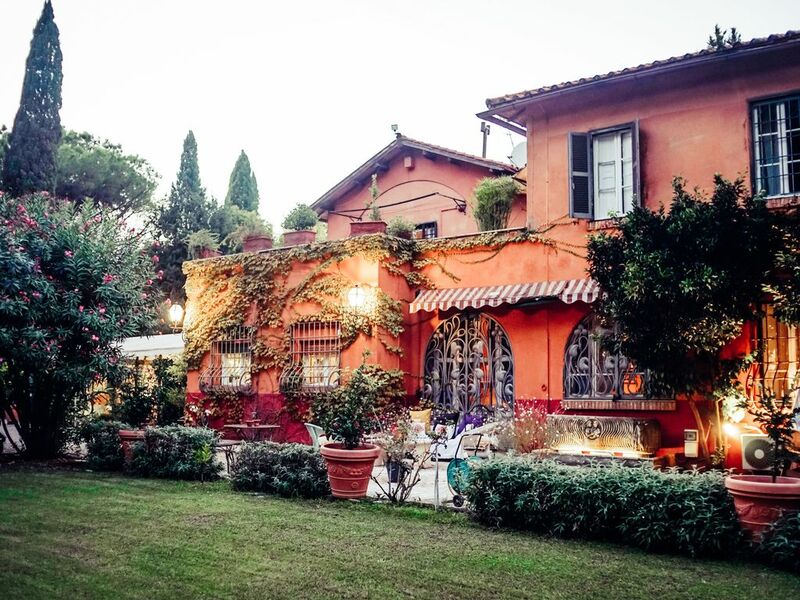 Villa Silj is located in Prima Porta, which is about 20 minutes by car from central Rome. We flew in from Seville in a direct Ryanair flight to Ciampino, rented a car, drove for about 30 minutes through the G.R.A. (the acronym for the city's highway belt) to exit 3 and arrived without too much difficulty. To get to Rome, we drove 5 minutes to Saxa Rubra train station, parked the whole day for 1,20 €, bought a train ticket (1,50 € per person each way), which left us at Piazza del Popolo.The train ride is not elegant, but it is hassle-free and inexpensive, two things I would not be able to say if I had to drive to the center of Rome and park. We spent our first full day seeing just about 10 of the 800 churches in Rome. Our second full day - we did not leave Villa Silj, and I preferred it! For two weeks Villa Silj was our home to 3 generations, 15 of us in all and we greatly enjoyed the villa's many assets; the beautiful grounds, the cooler location in the hills above Rome with good access to all the attractions in Rome. The thoughtful hosting from Bernard and his staff; the wonderful dinners, the driving services and all kinds of local information added a lot to our enjoyment of the villa. Villa Silj, although historic and interesting is not luxurious accommodation, but we were all comfortable and remember our time there as a wonderful holiday. This Roman Villa was fantastic to return to after a long hot day sightseeing in Rome. We were two families with 7 teenagers and rented two of the cottages. We greatly enjoyed the BBQ and pool and the grounds were lovely. It was a perfect set up for our families. We did not have cars and traveled by train and bus in and out of Rome. It was a great adventure and made us feel like locals just a little ! Other nearby places: Great restaurants all around and we also serve great food and wines. Seaside 40 mins away, beautiful lakes Bracciano, Vico, and hot springs 30 Min, spas, St. Peters, Vatican, Forum, Colosseum, Vallelunga, Olimpico and Flaminio Stadium, (football, soccer, rugby), Foro Italico Int tennis. Auditorium, Malborghetto, Tarquinia, Viterbo, Sutri, Tivoli, Tuscia Etruscan places, Subiaco. Welcome meal at Euro 35 / adult. Children under 10 years half price. Delicious Italian meals cooked under the veranda.